Imagine a flexible constitution which unites a cultural language split. 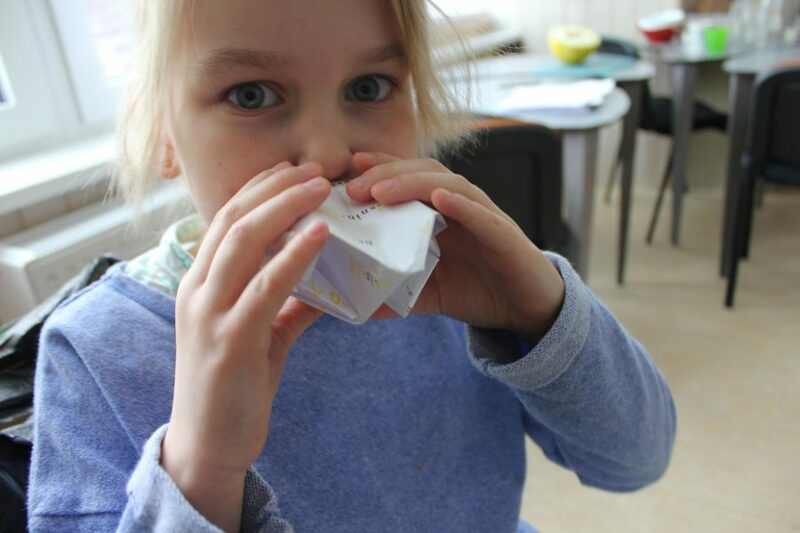 Artist Stine Marie Jacobsen invited children in Riga to join in a two week collaborative, multi-languaged and experimental writing workshop, where mother tongues were split, re-welded and transformed into new (step-)mother/pidgin tongues through translation of idioms, mutation of words and new laws. 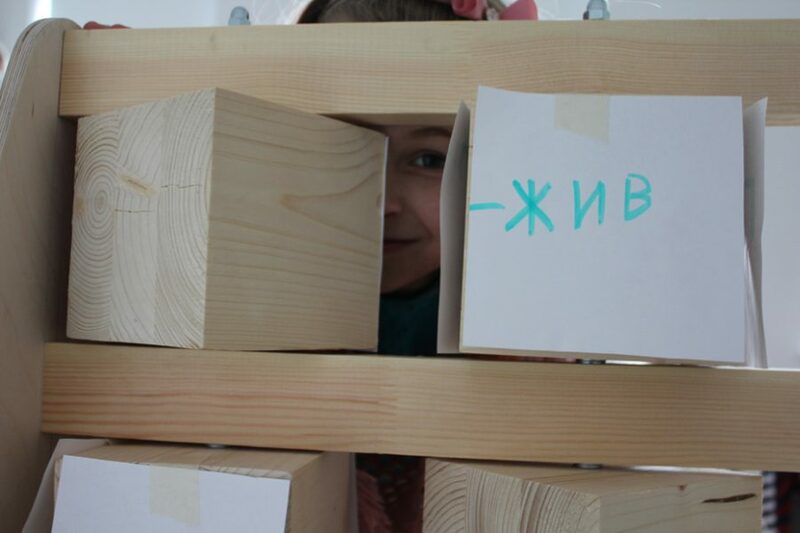 During the workshop, the children re-examined their relationship to both Latvian and Russian languages to create a dictionary for a new language through which they staked their claim on a future for Latvian culture. 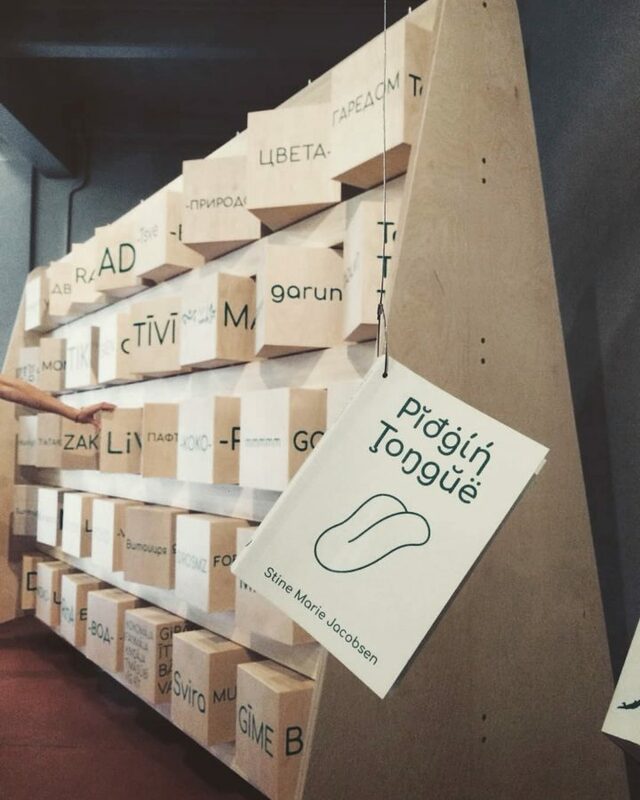 Pidgin Tongue (2018) draws on this vision from “the next generation” to develop a new “pidgin constitution” and make an absurdist monument sculpture for it – bringing attention to the fact that all constitutions are in essence arbitrary social constructs which enforce a normative set of “accepted” behaviours. The title refers to the term “pidgin language”, which is a simplified grammatical form of a language that can emerge between groups with different languages. Pidgin language can be built up of words, sounds and body language and the emphasis is more on co-created meaning to enable interaction. Pidgin languages have no native speakers and are thus not “owned” by any one group over another. 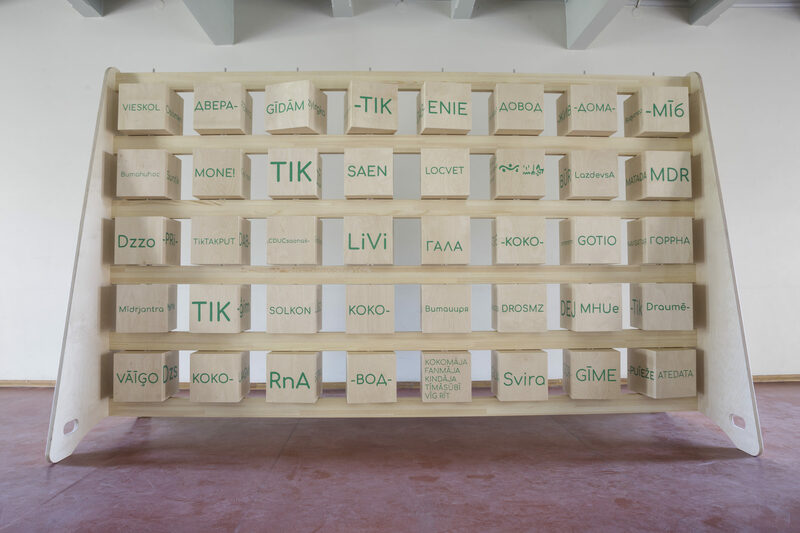 The purpose of Jacobsen’s project is to generate insight into the differences that arise in social recognition and perception in relation to the use different mother tongues in the same society. Pidgin Tongue creates an environment where the children can feel some freedom from the weight of the social ideologies and existing stigmas of this highly politicised topic in order to define their own relationship to the two languages. The project gives meaning and shape to young people’s dreams, fears and hopes for the future in Latvia, and comments on a shift in national empathy through an abstract review of the current constitution. 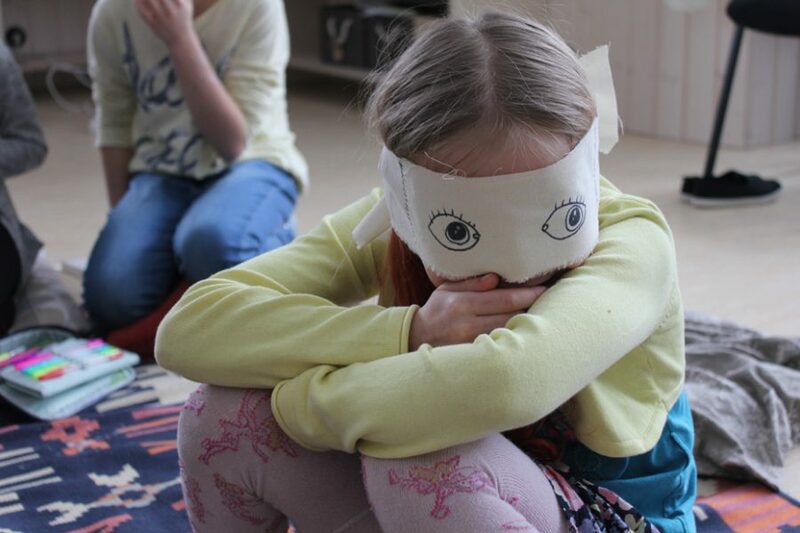 In the workshop playful exercises turn pictures into language, break stereotypes, explain and explore proverbs, jokes and verbs while looking at emotional links to language, how to mirror yourself in others and how the children understand themselves as a nation. And exploring intergenerational family dynamics and possible clashes between languages in the home in relation to eg school life. 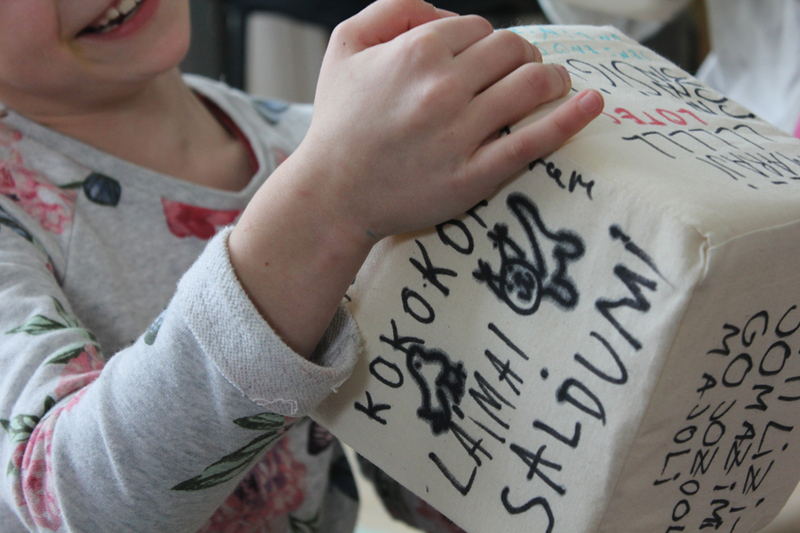 The results of Pidgin Tongues’ pilot explorations is shared in the book and a co-created sculpture inspired by the transnational Abacus calculator carries the children’s words on big movable cubes for the audience to interact with. Stine Marie Jacobsen worked on Pidgin Tongue with Latvian human rights lawyer Dace Kavasa and native Russian speaker Aleksandra Berditchevskaia, an advisor on civil engagement and participatory science policy and knowledge transfer practices, to explore a deeper interdisciplinary perspective on the project and ensure contextual sensitivity in its delivery and potential legacy. 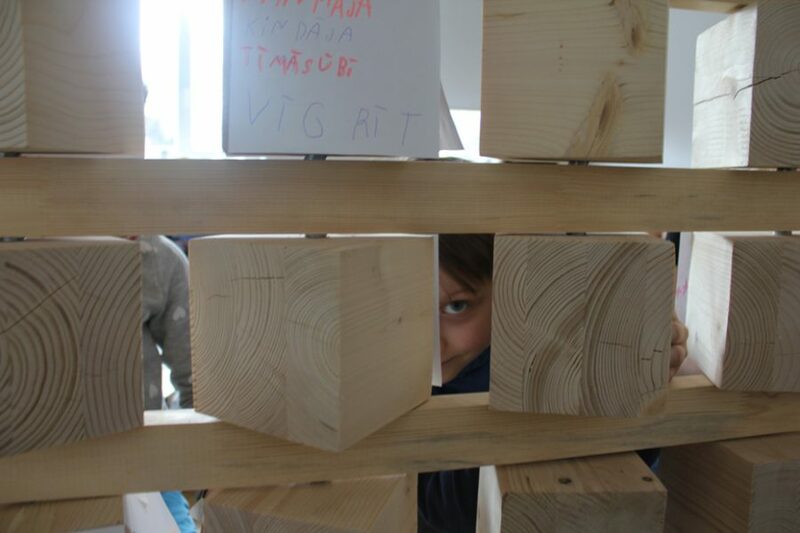 Working together with local actors to develop new tools, exercises and other observations to inspire future work with the Russian and Latvian language and cultural conflict, the project is maximally responsive to the inputs and needs of local teachers, institutions and schools throughout its implementation of the 1st Riga Biennial 2018. 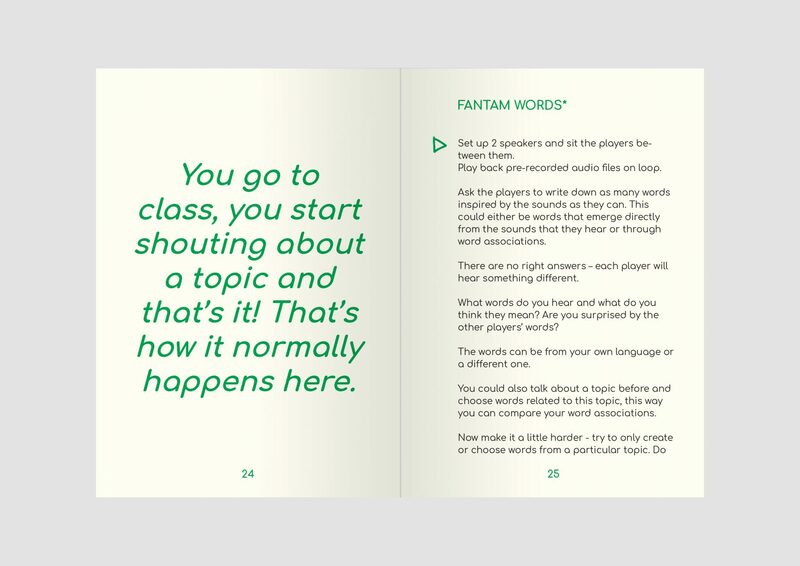 The Pidgin Tongue book is in English, Latvian and Russian, designed by Modem Studio and published by Broken Dimanche Press. Get the book here. 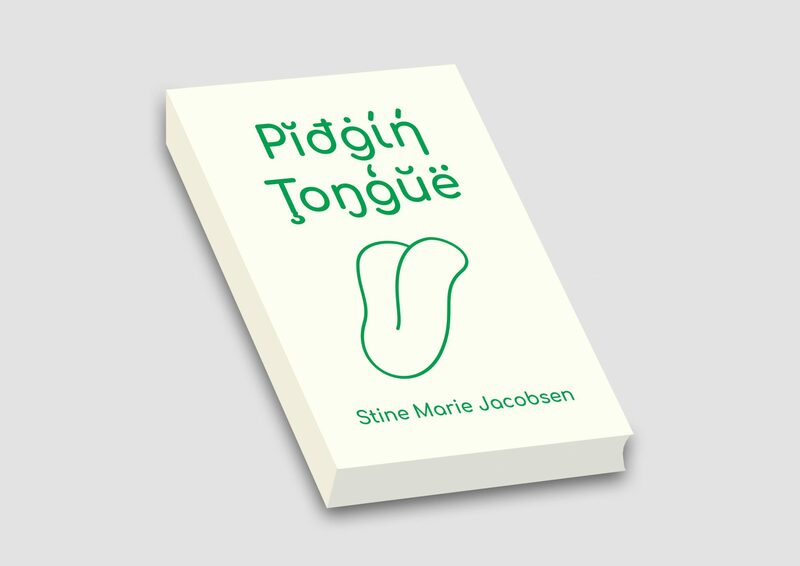 Pidgin Tongue, a book, sculpture and workshop project by artist Stine Marie Jacobsen, is a new commission by the 1st Riga Biennial 2018 and is supported by the Danish Arts Foundation.